Cuz you might need an ambulance. I have a thing for Japanese punk. I can’t fully explain it, but one aspect is that Japanese musicians are definitely “all in” – it’s a lifestyle. So that being said I’m always on the lookout for this kind of thing when I’m digging, and that’s how I pulled a copy of Mika Bomb’s The Fake Fake Sound of Mikabomb out of a box at a Seattle record show recently. A quick check online revealed that prior to this album Mika Bomb had been signed to the Beastie Boys’ label Grand Royal, and if they’re good enough for the Beasties they’re good enough for me. Mika Bomb is that perfect combination of pop punk and garage, consisting of an intentional rawness and strong pop aesthetic. The vocals are all in English and Mika’s signing is almost flawless – you could easily assume that she’s a native English speaker, and that makes the record all that much more approachable. 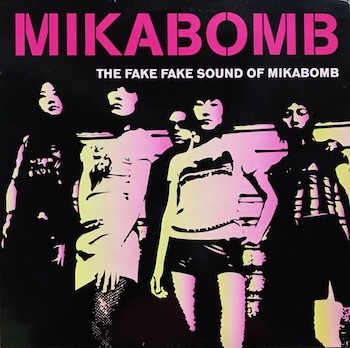 The Fake Fake Sound of Mikabomb is probably at the top of my list of favorite Japanese punk albums at the moment, definitely the one I’d reach to first if someone was looking to explore the genre. This entry was posted in Japan, Punk and tagged Beastie Boys, Garage, Grand Royal, Japan, Mika Bomb, Pop-Punk, Punk, The Fake Fake Sound of Mikabomb by Administrator. Bookmark the permalink.